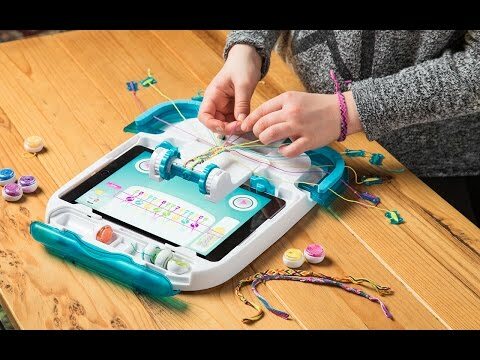 The i-Loom interactive bracelet maker engages young minds and hands, encouraging them to create. 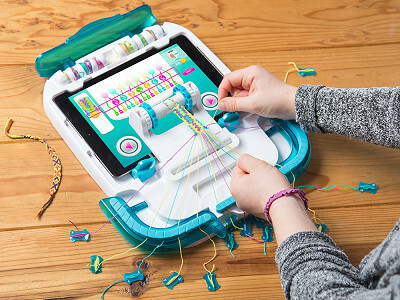 Designed as an all-inclusive work station for making friendship bracelets, detailed tutorials teach the basics and more advanced stitches through the free app. Five bracelet patterns are included to get you started. Your iPad locks securely into the tray above the bracelet winder—perfectly placed so you can see exactly what you need to do right above your bracelet. The base keeps your work in progress stable and provides the tension you need to knot. Bobbins keep thread neatly organized, making it easier to work. As you create, you earn Loomies—rewards you can redeem to purchase new patterns in the i-Loom store—or you can simply buy additional patterns. Connect with friends and other crafters in the app community to show off designs and trade tips. Tech-savvy kids will be inspired to use their tablet for real-world creativity. Hello everyone! I'm proud to introduce iLoom to The Grommet. I'd be happy to answer any questions you have! Does it only work with an iPad or can it work with any tablet? Following..... Great question also interested in the answer. @Dominique so in the meantime, can they use it without an iPad or should I wait for the Andriod app to be released? Hi Julie, you can use it independently without an iPad until the Android version comes out! @Mike Without I-Pod one can create this Interact handmade bracelet, keep some thing long and heavy on the table and start doing loops. What ios do I need? The real question being, will the app work with the ipad 1? @Carol We don't recommend using the app with an iPad 1. The recommended iPad are iPad3 and up and iPad Mini. Your iPad should be with iOS 7 and up. @Lisa Yes, it works. The iOS in the iPad Mini 2 is iOS 9.
does this work with Ipad Mini or just a normal Ipad? @James nevermind, saw previous answer :) Purchasing, thanks. Replacement thread/floss. Do you have a replacement kit or can you buy just regular DMC floss or similar floss? @Julie Yes we also have 3 theme kits that include our i-loom spools, bracelet locks and i-Patterns to unlock. Upon request, The Grommet could carry these items as well. @Dominique Can the thread spools be refilled? How much thread is in a spool? What is the difference between thread spools and the Delux locks? Hi Jackie, thanks for the comment! Each thread spool has 8.7 yards so there are 52.2 yards of thread total. The deluxe locks are for connecting the bracelet when you are done. They are the button-like objects you'll see in the photos if you click "buy" underneath the video. The gold and silver ones are considered the deluxe. My guess is it's because they are so fancy looking! At the moment we do not have thread spools for refill, but it is something we will look into if more people are looking for them. My iPad Air is in a thicker Zagg protective case. Will that still work with the I-Loom? @Susan the iPad needs to be removed of its protected case before sliding it into the i-loom device. No worries, it's very well protected with pads & locks. How about the iPad Pro? I know it's bigger, so will this device adjust? @Concetta The device wasn't develop for the iPad Pro, it has yet to be tested. A possible future update. Bummer this isn't available for Android/Amazon Fire OS. This would have been the perfect Christmas gift. 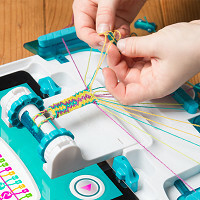 The i-Loom interactive bracelet maker engages young minds and hands, encouraging them to create. 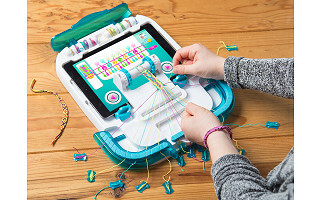 Designed as an all-inclusive work station for making friendship bracelets, detailed tutorials teach the basics and more advanced stitches through the free app. Five bracelet patterns are included to get you started. Your iPad locks securely into the tray above the bracelet winder—perfectly placed so you can see exactly what you need to do right above your bracelet. The base keeps your work in progress stable and provides the tension you need to knot. Bobbins keep thread neatly organized, making it easier to work. As you create, you earn Loomies—rewards you can redeem to purchase new patterns in the i-Loom store—or you can simply buy additional patterns.